Congrats to our sophomores and staff for completing MHS's first computer-based session of MCAS earlier this week! Staff, I can't thank you enough for your flexibility and preparation. Sophomores, we hope you felt prepared and confident in taking the test- if history is any indicator, I'm sure you all performed beautifully! Parents and Guardians, I'd like to once again invite you to attend a Principal's Roundtable Meeting with a focus on Class Rank on Tuesday, April 9th at 7:30AM in the library and again 6:30PM in Rm 182. Please RSVP by Friday, April 5th to Denise MacKillop (denise.mackillop@mansfieldschools.com or ext. 33105). 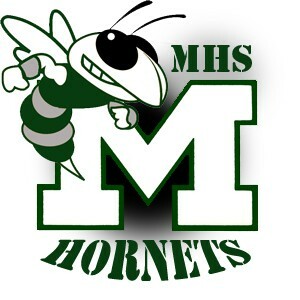 Also, later this spring MHS will be participating in two surveys: "Communities that Care" (all of grade 10) and "Youth Risk Behavior Survey" (selected classes 9-12). The surveys are anonymous and ask questions related to teen health and behaviors. Parents and guardians, if your child's class is participating, you will receive a letter in the mail with more information regarding the specific survey and the opt-out process. Please be on the look-out for the mailing. Finally, Class of 2019, graduation is looming large! Please read carefully everything that follows (just below my memo) regarding events and caps and gowns- our annual senior mailing should arrive at home by the end of next week. Graduation day is coming! On Tuesday, April 2nd our Cap and Gown company will be here during lunches to record each senior's height (only) for the graduation gown. Please look for a Senior Class mailing to arrive next week - you'll find a Senior Calendar and a letter with details about senior events including rehearsals, the All Night Party, Class Day, the Senior Boat Cruise, awards nights and the graduation ceremony on Sunday, June 2, 2019 at the Xfinity Center. Please look for this and stay tuned for more exciting news! By now all senior parents should have received a packet of information about the All Night Party. The ANP committee is busy planning a special night for your senior, but we need your help! We don’t want any senior to be left out of the slide show!! Please send jpg. 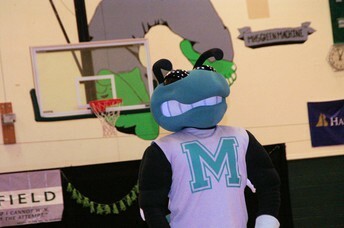 attachments of up to 8 photos of your senior through the years to mhsallnightparty19@gmail.com. Photos are due by April 26. Purchase a “HOME OF A 2019 MHS SENIOR” lawn sign. Enjoy dinner at Chipotle in Mansfield on Saturday March 30 from 5 – 9 PM. Show the flyer (found on our website) when ordering and 33% of your purchase will be donated directly to the ANP. Dine in or take out at Jake N JOES in Foxboro all day on April 11. Show the flyer (found on our website) to your server and 20% of your purchase will be donated to the ANP. All Night Party will take place on May 24-25. Roll out the red carpet and put on your Hollywood best..... time for Prom!!!! This year's Jr/Sr Prom will take place at Gillette Staidum (Putnam Club West) on Saturday, May 11 from 6-10:30PM. On April 1st, the juniors and seniors will have an informational assembly regarding prom. At this time they will receive a packet with permission forms - all forms must be completed in order to purchase tickets. Ticket are on sale from April 8th to April 12th. 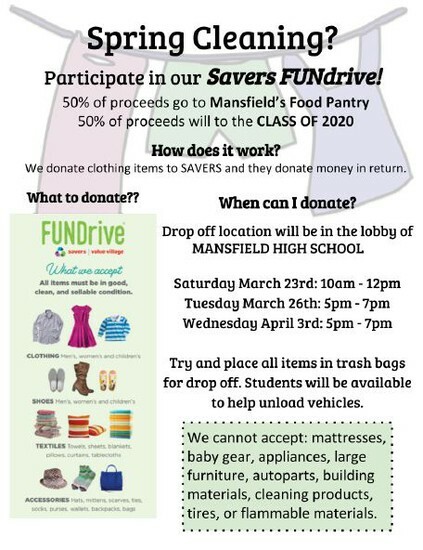 If you have any questions you may email ellen.dumont@mansfieldschools.com (junior class advisor). 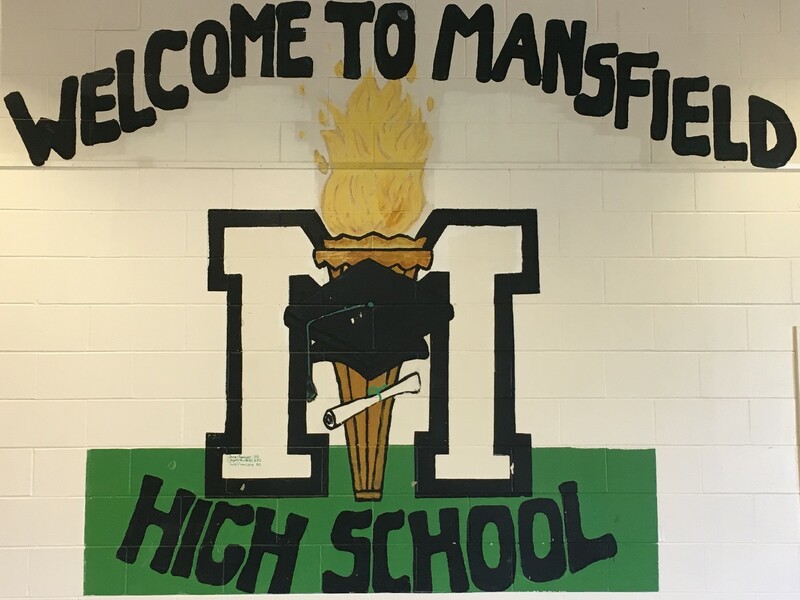 The 51st annual Mansfield Model Senate was held March 22nd in the Mansfield High School Media Center. 24 delegates (pictured below) vigorously debated 9 bills. Model Senate is a unique part of the Mansfield High School Social Studies curriculum. This program exposes students to the legislative process and provides them with the opportunity to legislate in both school-wide and regional meets. Every junior is responsible for creating, researching, and defending a bill. 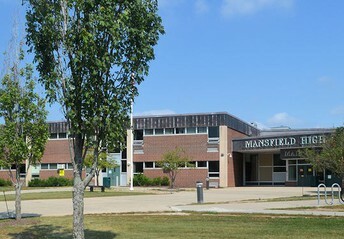 One bill is then chosen by each class to attend the Mansfield Model Senate. 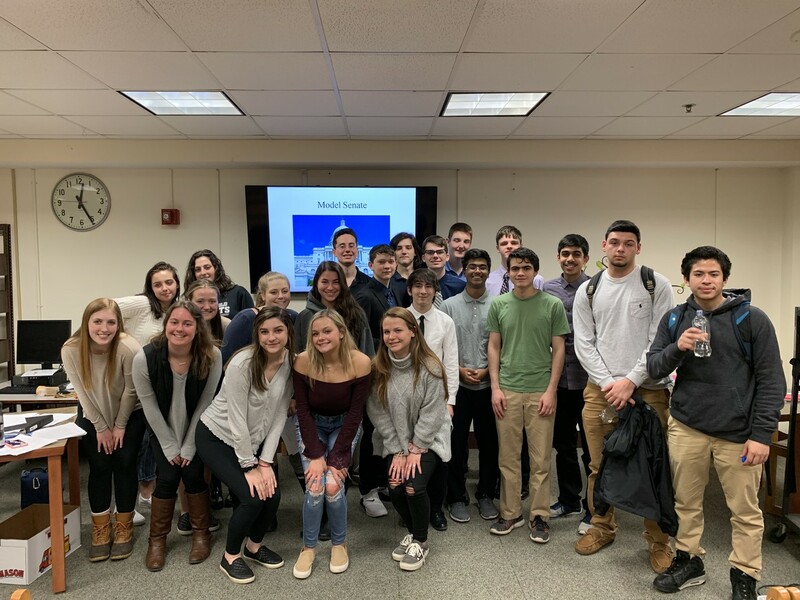 The Mansfield Model Senate then chooses delegates to represent Mansfield High School at the Hocomock League Model Senate that will be held at Oliver Ames High School on April 8th and 9th. Students will compete against other teams from nine member schools. As we transition into spring sports, let's not forget another tremendous success from winter... wrestling won the Hockomock title this year and one of our wrestlers, Jayden Curley, took first place in his all state weight class. Way to go, Jayden- state champ!! 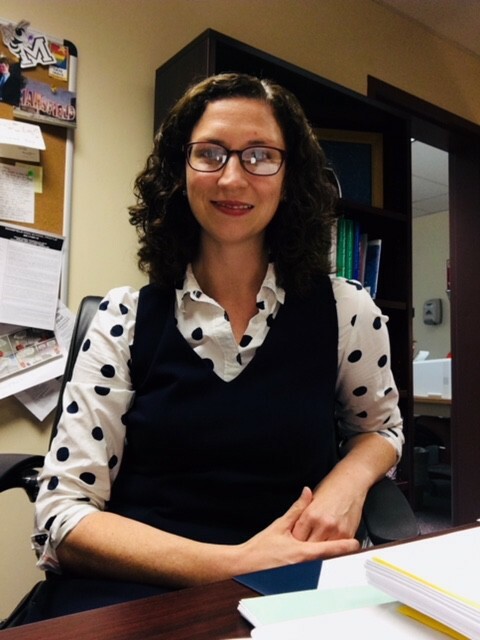 Take a look at this article for all the details! 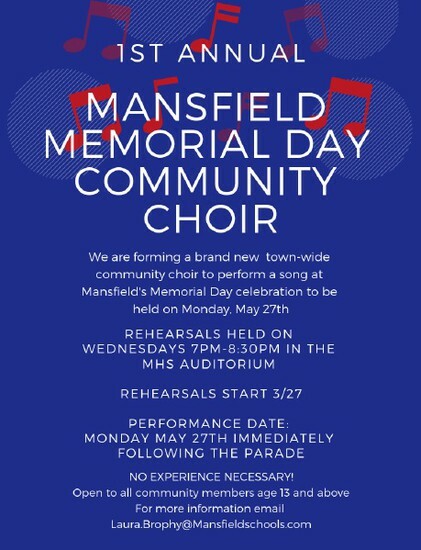 Join the 1st Annual Mansfield Memorial Day Community Choir! We are forming a brand new town-wide community choir to perform a song at Mansfield's Memorial Day celebration to be held on Monday, May 27th. Rehearsals will be held Wednesdays from 7-8:30PM in the MHS Auditorium beginning March 27th. Tuesday, April 2nd is Autism Awareness Day. 1 in 60 children is diagnosed with Autism and over 3.5 million Americans live with an autism spectrum disorder. Please wear your favorite shade of blue on Tuesday April 2nd to help Best Buddies raise awareness for Autism and all those affected by it. Come one, come all! 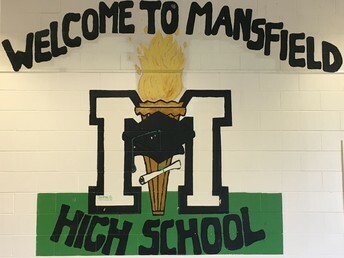 The Class of 2019 would like to invite you this year’s Mr. Mansfield! Tonight, March 29th, Aidan Sacco, Jackson Miller, Greg Waters, and Nick Levine will be dazzling the crowd and judges with their smooth dance moves and talent displays, and they would love for you to come cheer them on! The show starts at 7pm in the MHS Auditorium. Tickets will be on sale at the door. Tickets are $5 for Mansfield students and $7 for adults. Don't forget to bring along some spare change...during the intermission you can use it to vote for the gentleman that you think should win it all! It will surely be a night you don't want to miss, make sure you come cheer on your favorite competitor! Great news! Our yearbook publisher has let us know that they will definitely be sending us at least 15 extra books! Order NOW to reserve one for $73! Any books sold after delivery will be $90. Please email jennifer.martinelli@mansfieldschools.com to buy your copy now and be sure to have a book waiting for your student on distribution day! All bus transportation information, including forms and routes, is available on the District Home Page. Please click here: Bus Transportation.